I thought I would share another awesome score from my neighbor's garage sale a few weeks ago. 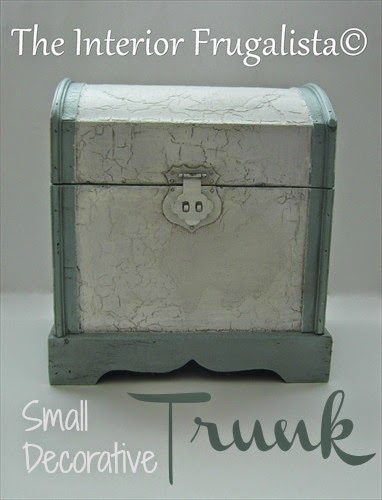 I'm a sucker for trinket boxes and small trunks so when I saw this small decorative trunk sitting on one of the tables I grabbed it. Here is what it looked like when I bought it. A wooden scalloped base and faux snake skin body that needed some TLC. I contemplated giving the base a fresh coat of dark stain and polishing the faux snake skin back to it's original lustre because the colors worked well in my living room. But then I could see it in a crisp white finish and so I went with it. The exterior was painted in Simplicity White and the details in Elegance, both chalk paint from Country Chic Paint. After a coat of clear wax I rubbed dark wax into the all crevices and it instantly took on an antiqued look. Love it! 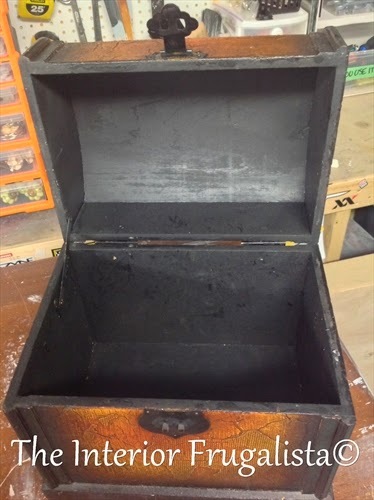 This is what the inside of the box looked like. I painted the entire inside of the trunk with Elegance. 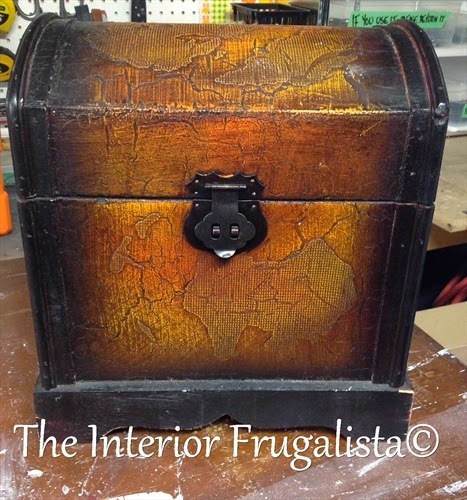 To add a little surprise when you opened the lid I stenciled a Fleur De Lis and then dark waxed it to give it an antiqued finish. To pretty the inside up a little more I lined the bottom with vintage scrapbook paper. I think it looks far prettier now than in its original state. Don't you think it would look lovely sitting on a white chippy bedroom dresser, dining room sideboard or bookcase?